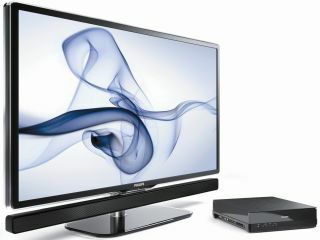 Philips has launched its latest flatscreen effort, the Essence 42PES0001, and hopes that the TV-buying public will finally get on board with hanging their sets on the wall. Quite why it's so important to Philips that consumers put their new shiny pride and joy on the wall is a mystery... but the inclusion of a 'smart' levelling bracket as well as making the TV a dainty 16kg hints at such. You might remember the Essence from TechRadar's coverage of the IFA event in Berlin earlier this year, when we brought you word of this new set. It features a single cable carrying the sound, picture and power from a separate connectivity hub, which can be placed up to four metres away. It's also just 38mm deep at the thickest point, with three HDMI inputs and Full HD with Philips Perfect Pixel HD Engine, 2ms response time and a nice 60,000:1 contrast ratio. It also features a 2x 15W speaker bar, which can be connected to the bottom of the TV or removed if you'd rather use an existing set up. There's also connectivity to a DLNA set up if you're one of the four people in the world that's worked out how to make your devices talk to each other using the network. The Essence does come with a £2,000 price tag (well, a pound under), which is a little pricier than other efforts at a similar screen size, but you're clearly paying for the style as well as the functionality. Available later this month from TV buying places.